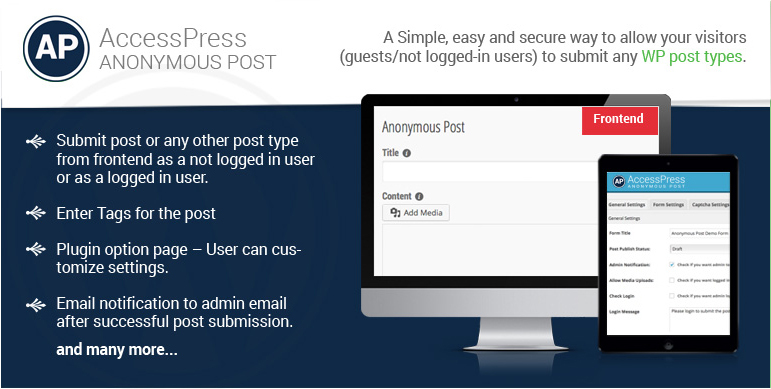 Anonymous posting (guest posting / front end posting / posting without login) – is made easy with AccessPress Anonymous Post. AccessPress Anonymous Post – is a responsive HTML5 form to allow your website users (guests/visitors/not logged in users) to submit a Standard WordPress Post in an easy and customized way, including featured image. If you’re looking for Free WordPress Anonymous post plugin, User Post Plugin, guest post plugin, Front end post plugin, Guest Author plugin, Frontend form post feature, Guest blogging plugin, User submitted post then AccessPress Anonymous Post is the right one! Show/Hide field like post title, post content, post excerpt etc to the frontend. Editable form labels, tooltips/suggestive texts, all titles. All texts are editable – so use any language you like! Post category selection made easy to categories post. Hey Buddy!, I found this information for you: "WordPress Frontend Post Plugin – AccessPress Anonymous Post". Here is the website link: https://access-keys.com/wordpress-plugins/accesspress-anonymous-post/. Thank you.